What started with a farmer’s dream has evolved into a company that is one of the top competitors in the barbecue market. Ellis soon realized that making the smokers out of his garage was no longer viable or effective. He moved the production to Ponca City where today Cookshack employs about 25 people in their 21,000-square-foot factory. In 2003, Cookshack began a relationship with Fast Eddy’s BBQ to manufacture a new line of large pit smokers, dubbed the Fast Eddy’s by Cookshack. Ed Maurin has won many championships on the barbecue circuit with his innovative pellet-feed pits. Cookshack added its manufacturing expertise to create a range of smokers. The company has grown from sales of about $1 million in 1990 to its current $6 million annually. Cookshack now produces a variety of residential smokers, as well as several models of smoker ovens used by restaurants, caterers, delicatessens, grocery stores, meat markets, and small meat processors. “Sizes range from home models that cook 30 pounds to the giant commercial models that are the size of an 11-foot cube and smoke up to 750 pounds of meat at a time,” Powell said. The one thing they all have in common is the quality of construction. The units are housed in thick stainless steel that competitors often skimp on. Years of innovation also pay off for the owners. Cookshack smokers are now designed with digital controls, which eliminate temperature spikes and allows for meticulous control of heat. The price has nearly doubled over the past three years, but Cookshack refuses to compromise its product. “It’s what people have come to expect and we have a lot invested in the Cookshack name. We wouldn’t risk that by lowering the quality of our products,” Powell added. The recent rise in transportation costs is also a factor. Some of that overhead is offset, however, by savings realized through the recent implementation of Lean Manufacturing principles. 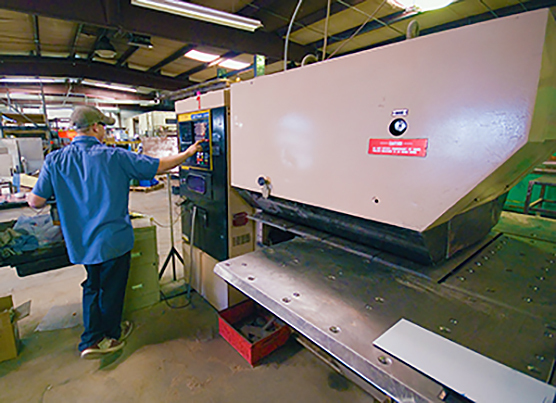 Doug Taylor, manufacturing extension agent for the Oklahoma Manufacturing Alliance, helped the company through its Lean transformation. Taylor is sponsored locally by Pioneer Technology Center and Northern Oklahoma College. He called on Industrial Solutions, a private consulting company, to help implement change-over projects. Looking toward the future, Taylor put Cookshack in contact with Andrew Ranson of Giant Partners in Oklahoma City. Giants Partners helped Cookshack with a strategic planning process to clarify what it is best at and how the company can best excel at those things. “We believe there is power in clarity and we helped clarify their strengths to help align the company,” Ranson said. Through sessions with Ranson, Cookshack now has a better understanding of who it is and how to best move forward in its marketplace. Everything Cookshack does is ultimately about the barbecue, Powell said. And when it comes to great barbecue, nothing is confidential. It’s a Sooner State tradition. As summer temperatures rise, folks will gather with friends and family for an Oklahoma-style barbecue. The best chefs (and those backyard wannabes) looking for the highest quality equipment turn to one place—Cookshack. The Ponca City manufacturer has provided top-of-the-line smokers to barbecue lovers for nearly 50 years.